Not to be confused with American Research and Development Corporation, Remington Rand, or Ingersoll Rand. "RAND" redirects here. For other uses, see Rand (disambiguation). RAND has approximately 1,850 employees. Its American locations include: Santa Monica, California (headquarters); Arlington, Virginia; Pittsburgh, Pennsylvania; the San Francisco Bay Area; and Boston, Massachusetts. The RAND Gulf States Policy Institute has an office in New Orleans, Louisiana. RAND Europe is located in Cambridge, United Kingdom, and Brussels, Belgium. RAND Australia is located in Canberra, Australia. RAND is home to the Frederick S. Pardee RAND Graduate School, one of eight original graduate programs in public policy and the first to offer a PhD. The program aims to provide practical experience for its students, who work with RAND analysts on real-world problems. The campus is at RAND's Santa Monica research facility. The Pardee RAND School is the world's largest PhD-granting program in policy analysis. Unlike many other universities, all Pardee RAND Graduate School students receive fellowships to cover their education costs. This allows them to dedicate their time to engage in research projects and provides them on-the-job training. RAND also offers a number of internship and fellowship programs allowing students and outsiders to assist in conducting research for RAND projects. Most of these projects are short-term and are worked on independently with the mentoring of a RAND staff member. RAND publishes the RAND Journal of Economics, a peer-reviewed journal of economics. Thirty-two recipients of the Nobel Prize, primarily in the fields of economics and physics, have been associated with RAND at some point in their career. General Henry H. Arnold, commander of the United States Army Air Forces, established Project RAND with the objective of looking into long-range planning of future weapons. In March 1946 Douglas Aircraft Company was granted a contract for research on intercontinental warfare, using operations research. In May 1946 the Preliminary Design of an Experimental World-Circling Spaceship was released. In May 1948, Project RAND separated from Douglas and became an independent non-profit organization as Douglas Aircraft feared it would create conflicts of interest jeopardizing future hardware contracts. Initial capital for the spin-off was provided by the Ford Foundation. RAND was created after individuals in the War Department, the Office of Scientific Research and Development, and industry began to discuss the need for a private organization to connect military planning with research and development decisions. On 1 October 1945, Project RAND was set up under special contract to the Douglas Aircraft Company and began operations in December 1945. By late 1947, Project RAND considered operating as a separate organization from Douglas and in February 1948, the Chief of Staff of the newly created United States Air Force wrote a letter to the president of the Douglas Aircraft Company that approved the evolution of Project RAND into a nonprofit corporation, independent of Douglas. On 14 May 1948, RAND was incorporated as a nonprofit corporation under the laws of the State of California and on 1 November 1948, the Project RAND contract was formally transferred from the Douglas Aircraft Company to the RAND Corporation. Since the 1950s, RAND research has helped inform United States policy decisions on a wide variety of issues, including the space race, the U.S.-Soviet nuclear arms confrontation, the creation of the Great Society social welfare programs, the digital revolution, and national health care. Its most visible contribution may be the doctrine of nuclear deterrence by mutually assured destruction (MAD), developed under the guidance of then-Defense Secretary Robert McNamara and based upon their work with game theory. Chief strategist Herman Kahn also posited the idea of a "winnable" nuclear exchange in his 1960 book On Thermonuclear War. This led to Kahn being one of the models for the titular character of the film Dr. Strangelove, in which RAND is spoofed as the "BLAND Corporation". RAND was incorporated as a non-profit organization to "further promote scientific, educational, and charitable purposes, all for the public welfare and security of the United States of America". Its self-declared mission is "to help improve policy and decision making through research and analysis", using its "core values of quality and objectivity". The achievements of RAND stem from its development of systems analysis. Important contributions are claimed in space systems and the United States' space program, in computing and in artificial intelligence. RAND researchers developed many of the principles that were used to build the Internet. RAND also contributed to the development and use of wargaming. Current areas of expertise include: child policy, civil and criminal justice, education, health, international policy, labor markets, national security, infrastructure, energy, environment, corporate governance, economic development, intelligence policy, long-range planning, crisis management and disaster preparation, population and regional studies, science and technology, social welfare, terrorism, arts policy, and transportation. RAND designed and conducted one of the largest and most important studies of health insurance between 1974 and 1982. The RAND Health Insurance Experiment, funded by the then–U.S. Department of Health, Education and Welfare, established an insurance corporation to compare demand for health services with their cost to the patient. According to the 2005 annual report, "about one-half of RAND's research involves national security issues". Many of the events in which RAND plays a part are based on assumptions which are hard to verify because of the lack of detail on RAND's highly classified work for defense and intelligence agencies. The RAND Corporation posts all of its unclassified reports in full on its website. John von Neumann, consultant to the RAND Corporation. Robert Aumann: mathematician, game theorist, won the Nobel Prize in Economics. Franklin R. Collbohm: Aviation engineer, Douglas Aircraft Company, RAND founder and former director and trustee. Karen Elliott House: Chairman of the Board, 2009–present, former publisher, The Wall Street Journal; Former Senior Vice President, Dow Jones & Company, Inc.
Horace Rowan Gaither: Chairman of the Board, 1949–1959, 1960–1961; known for the Gaither Report. Donald Rumsfeld: Chairman of board from 1981 to 1986; 1995–1996 and secretary of defense for the United States from 1975 to 1977 and 2001 to 2006. ^ a b Medvetz, Thomas (2012). Think Tanks in America. Chicago: University of Chicago Press. p. 26. ISBN 9780226517292. Retrieved 25 April 2015. ^ a b c "RAND Leadership". RAND Corp. Retrieved 3 May 2017. ^ "RAND Corporation Board of Trustees". RAND Corp. Retrieved 16 January 2015. ^ a b "Financial Statements, FY 2016". RAND Corp. Retrieved 9 March 2017. ^ "U.S. and Canadian Institutions Listed by Fiscal Year 2016 Market Value of Endowment Assets and Percentage Change* in Endowment Market Value from FY2015 to FY2016" (PDF). NACUBO.org. Retrieved 12 April 2017. ^ a b "2013 RAND Annual Report". RAND Corp. Retrieved 16 January 2015. ^ a b "About RAND - Vision". RAND. Retrieved 16 January 2015. ^ a b "History and Mission". RAND Corp. Retrieved 16 January 2015. ^ a b c "How We're Funded". RAND Corp. Retrieved 16 January 2015. ^ "RAND Locations". RAND Corp. Retrieved 10 May 2017. ^ "RAND Europe Contact Information". RAND Corp. Retrieved 16 January 2015. ^ "RAND Locations: Canberra, Australia Office". RAND Corp. Retrieved 16 January 2015. ^ a b "Pardee RAND History". Pardee RAND Graduate School. Retrieved 21 February 2014. ^ a b c d e "RAND at a Glance". RAND Corp. Retrieved 31 December 2013. ^ Sarabi, Brigette (1 January 2005). "Oregon: The Rand Report on Measure 11 is Finally Available". Partnership for Safety and Justice (PSJ). Retrieved 15 April 2008. ^ Harvard University Institute of Politics. "Guide for Political Internships". Harvard University. Retrieved 18 April 2008. ^ Johnson, Stephen B (2002). The United States Air Force and the Culture of Innovation 1945-1965 (PDF). Diane Publishing. p. 32. ISBN 9781428990272. Retrieved 16 January 2015. ^ Jardini, David R. (2013). Thinking Through the Cold War: RAND, National Security and Domestic Policy, 1945-1975. p. 10. ^ Twing, Steven W. (1998). Myths, models & U.S. foreign policy. Lynne Rienner Publishers. ISBN 1-55587-766-4. ^ Hanks, Robert (19 December 2007). "The Week In Radio: The think tank for unthinkable thoughts". The Independent. London. Retrieved 24 June 2009. ^ Kaplan, Fred (10 October 2004). "Truth Stranger Than 'Strangelove'". The New York Times. Retrieved 24 June 2009. ^ Davies, Merton E.; Hams, William R. (September 1988). RAND's Role in the Evolution of Balloon and Satellite Observation Systems and Related U.S. Space Technology (PDF). RAND Corp. Retrieved 16 January 2015. ^ "Paul Baran - Posthumous Recipient". Internet Hall of Fame. Internet Society. 2012. Retrieved 16 January 2015. ^ Perla, Peter P. (1990). The Art of Wargaming: A Guide for Professionals and Hobbyists. Annapolis, Md. : Naval Institute Press. pp. 114–118. ISBN 0870210505. Retrieved 16 January 2015. ^ Perry, Walter L.; Pirnie, Bruce R.; Gordon, John (1999). Issues Raised During the 1998 Army After Next Spring Wargame. Santa Monica, CA: RAND. ISBN 0-8330-2688-7. Retrieved 16 January 2015. ^ "Policy Experts". RAND Corp. Retrieved 16 January 2015. ^ "RAND's Health Insurance Experiment (HIE)". RAND Corp. Retrieved 16 January 2015. ^ Herdman, Roger C.; Behney, Clyde J. (September 1993). "Chapter 3: The Lessons and Limitations of the Rand Health Insurance Experiment" (PDF). Benefit Design in Health Care Reform: Patient Cost-Sharing (Princeton University): 23–38. Retrieved 16 January 2015. ^ "F. R. Collbohm, 83, Ex-Head of Rand, Dies". The New York Times. Associated Press. 14 February 1990. Retrieved 14 June 2013. ^ Dole, Stephen H. (2007). Habitable Planets for Man (New RAND ed.). Santa Monica, CA: RAND Corp. ISBN 9780833042279. Retrieved 16 January 2015. ^ "Habitable Planets for man (6.4 MB PDF)". RAND Corporation (free PDFs). ^ "Stephen H. Dole; Retired Head of Rand Corp.'s Human Engineering Group". Los Angeles Times. 30 April 2000. ISSN 0458-3035. Retrieved 12 September 2016. ^ "Obituary: Paul Y. Hammond". University of Pittsburgh. 5 April 2012. ^ "Computer Science History". School of Computing. University of Utah. Retrieved 24 August 2017. ^ Noland, Claire (12 April 2007). "Konrad Kellen, 93; Rand researcher studied Vietnam War and urged withdrawal of troops". Los Angeles Times. Archived from the original on 11 July 2013. Retrieved 13 July 2013. ^ The Wizards of Armageddon - Fred M. Kaplan - Google Boeken. Books.google.nl. Retrieved 14 June 2013. ^ Seymour M. Hersh (12 May 2003). "Selective Intelligence — Donald Rumsfeld has his own special sources. Are they reliable?". The New Yorker. Alex Abella. Soldiers of Reason: The RAND Corporation and the Rise of the American Empire (2008, Houghton Mifflin Harcourt hardcover; ISBN 0-15-101081-1 / 2009, Mariner Books paperback reprint edition; ISBN 0-15-603344-5). S.M. Amadae. Rationalizing Capitalist Democracy: The Cold War Origins of Rational Choice Liberalism (2003, University Of Chicago Press paperback; ISBN 0-226-01654-4 / hardcover; ISBN 0-226-01653-6). Agatha C. Hughes and Thomas P. Hughes (editors). Systems, Experts, and Computers: The Systems Approach in Management and Engineering, World War II and After (2000, The MIT Press hardcover, part of the Dibner Institute Studies in the History of Science and Technology; ISBN 0-262-08285-3 / 2011, paperback reprint edition; ISBN 0-262-51604-7). David Jardini. Thinking Through the Cold War: RAND, National Security and Domestic Policy, 1945–1975 (2013, Smashwords; Amazon Kindle; ISBN 9781301158515). Fred Kaplan. The Wizards of Armageddon (1983, Simon & Schuster hardcover, first printing; ISBN 0-671-42444-0 / 1991, Stanford University Press paperback, part of the Stanford Nuclear Age Series; ISBN 0-8047-1884-9). Edward S. Quade and Wayne I. Boucher (editors), Systems Analysis and Policy Planning: Applications in Defense (1968, American Elsevier hardcover). Bruce L.R. Smith. The RAND Corporation: Case Study of a Nonprofit Advisory Corporation (1966, Harvard University Press / 1969; ISBN 0-674-74850-6). Marc Trachtenberg. History and Strategy (1991, Princeton University Press paperback; ISBN 0-691-02343-3 / hardcover; ISBN 0-691-07881-5). Clifford, Peggy, ed. "RAND and The City: Part One". Santa Monica Mirror, 27 October 1999 – 2 November 1999. Five-part series includes: 1; 2; 3; 4; & 5. Retrieved 15 April 2008. 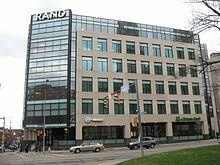 Wikimedia Commons has media related to RAND Corporation.